Who shot down Malaysian Airlines MH17? Another Malaysian Airliner down. This time its taken out by a missile fired from the eastern Ukraine. 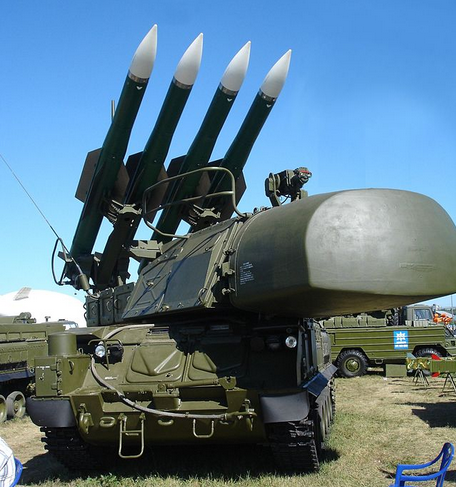 While Moscow hurriedly tries to cover its tracks with regards to missile technology it has exported to the Russian separatists – and here I mean the BUK system – there are signs to follow allowing reasonable people to point a finger. But the black boxes are not going to tell us much more than where the missile struck. And by all accounts, given the fact that the tail section separated early, it appears we know what brought it down. Who fired the missile? The multimillion dollar question. And why did Malaysian Airlines continue to fly a route that was dangerous? Pilots talking on PPRUNE have repeatedly warned about the Ukraine corridor. Looking at this event, its clear that Russia is in a spot of bother. While it would serve Kiev to have the rebels blamed, the events immediately after the crash are illuminating. 1) Pro-Russian rebels congratulated themselves on downing an Antonov 26. Propaganda arm Russian TV then report that minutes earlier, a Ukranian military plane was downed by the “heroes”. 2) Within half an hour, rebels realise that the bodies falling from the sky include women and children. And the plane is clearly a civilian airline. 3)Recordings begin circulating of pro-Russian separatists talking about the error. These are quickly expunged from the internet. 4) Video recordings on youtube of a rebel placed BUK system in a nearby village mysteriously vanish. Fortunately alert web-harvesters quickly download before Moscow/rebels/whomever removes them. SEVENTEEN Mi-8 and Mi-24 military helicopters. Clearly the rebels had mobilised their ground-to-air missile capability and were practicing a lot. And what better to practice on than a plane that appears on their BUK radar (which can track planes for 140km) and high enough to be a spy plane from the west. 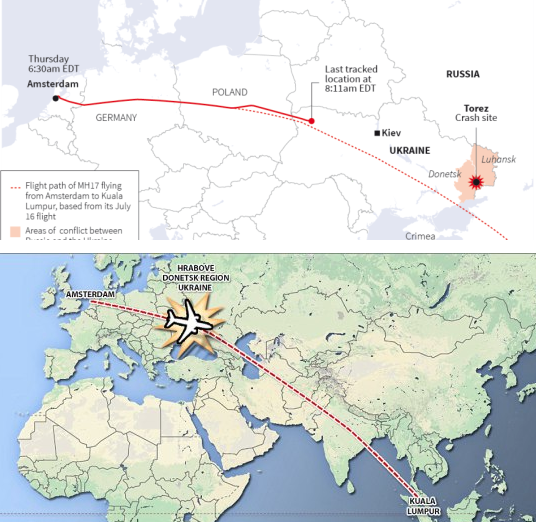 While Air France amongst others has flown this route, the MH17 track is much closer to their BUK launch vehicles than previously. So a semi-vodka induced thug sitting inside one of these mobile units picks up the cursor on his radar – tracks the plane until its overhead and BAM! While Vladimir Putin points his finger at Kiev and Lavrov indulges in red herrings (eg, the black boxes which matter only a little in this case), the initial evidence is rather damning. One wonders what spin is to emerge from Moscow this time. And one wonders what Kuala Lumpur will do. Given the Malaysian government’s utterly useless reaction to their previous air disaster – who knows? This entry was posted in Uncategorized and tagged BUK, Malaysian Airlines, MH17, Moscow, pro-Russian, Russia, Russian separatists, Ukraine by desmondlatham. Bookmark the permalink.